It’s the second Thursday of the month and that means… Silhouette Challenge time! Since we are all thinking food and entertaining this month, the theme for the challenge was Dining. 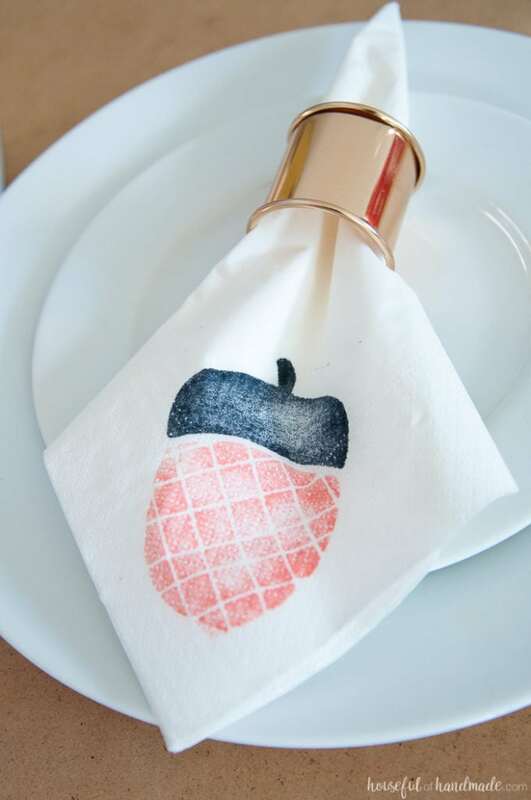 To add a little flair to our Thanksgiving table, I made these Homemade Decorative Napkins from some acorn stamps I made with my Silhouette. Now we are ready for the turkey and family to come together! As much as I love cloth napkins, I really love the convenience of paper napkins. Kids can be so messy! I would be doing laundry forever if we used cloth napkins. And when we have lots of guests over (like for Thanksgiving dinner) I just don’t have that many cloth napkins in my arsenal. I thought it would be fun to decorate paper napkins so that they can be festive for the holiday. The next question was how to decorate napkins? That is where my Silhouette came in. 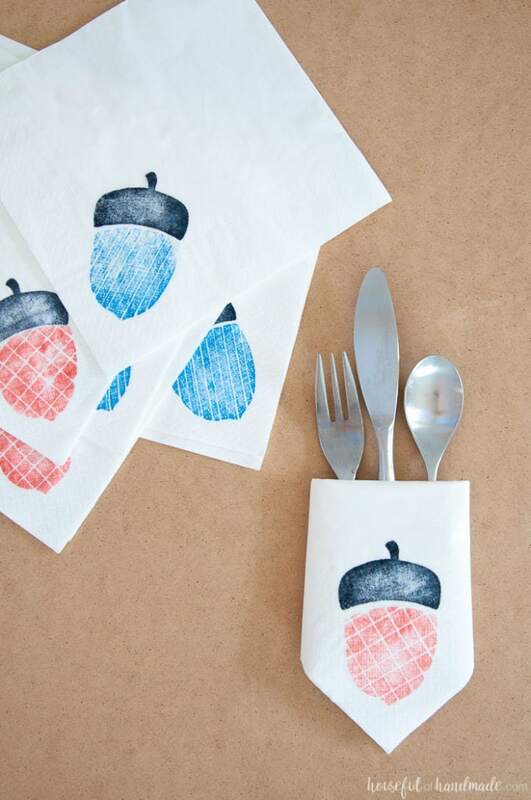 By making a few simple stamps (out of the acorns I designed for this month’s free digital backgrounds) I was able to make the perfect homemade decorative napkins for Thanksgiving. And they were so easy to make! So this month’s tutorial is actually 2 tutorials in one. First I will show you how to easily make foam stamps on your Silhouette cutting machine. Then I will show you how easy it was to decorate paper napkins for our Thanksgiving table (I even decided to do a video for you, yeah). But it doesn’t stop there, I’m going to be using this method to decorate napkins for every holiday. Or even custom birthday, baby shower, or wedding napkins. The possibilities are endless! 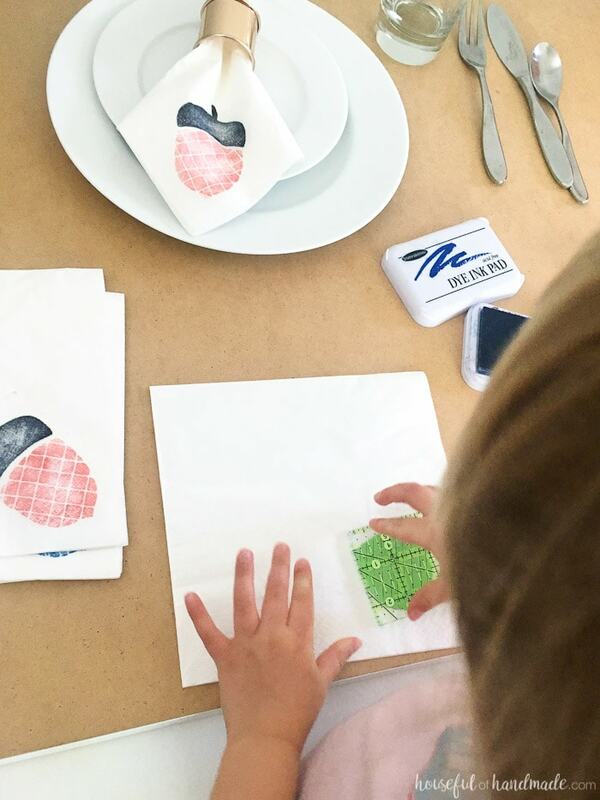 And bonus, these custom decorative paper napkins are so easy to make, you can have your kids work on them while you cook the turkey. My kids were having so much fun making them. 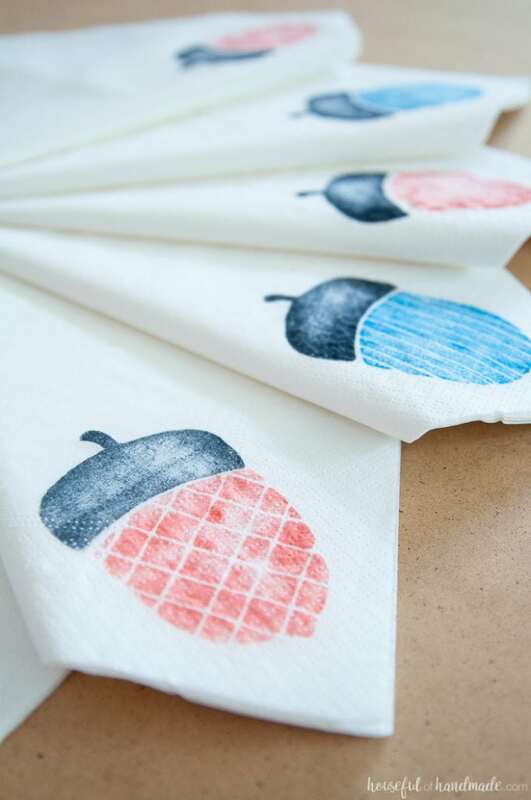 I have a feeling we are going to have so many custom acorn napkins that we will be using them until summer. Oh well, at least they are having fun! 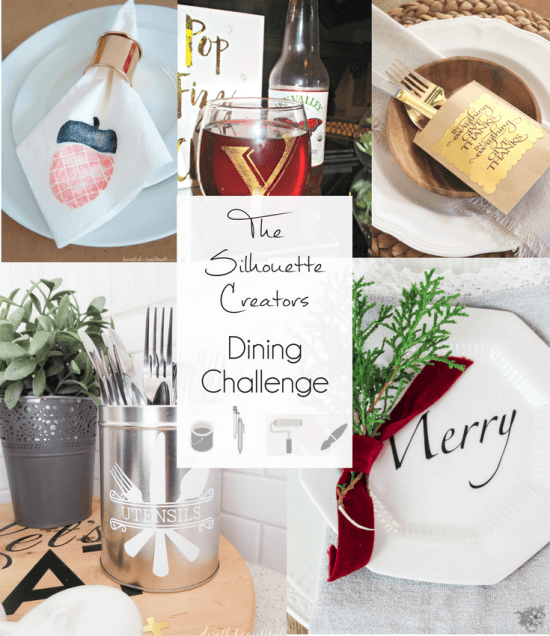 Don’t forget to check out the rest of the projects these amazing bloggers created for the dining themed Silhouette challenge. Now we will be ready to entertain this holiday season! These are sooo pretty! I totally didn’t realize that they were paper napkins at first. That’s brilliant! Thanks for sharing with us at Merry Monday this week! Thank you Marie! I love that the paper napkins can be pretty. These are so cute Kati! 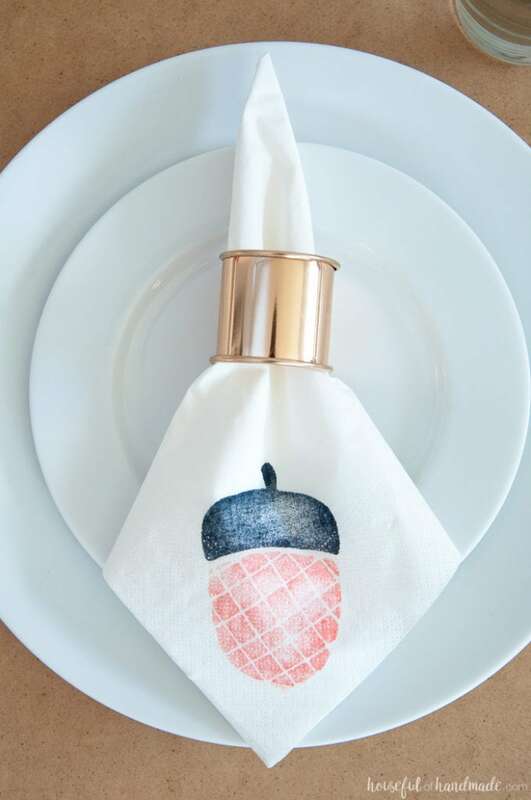 I would have never thought to decorate paper napkins, and for the life of me, I don’t know why! It is a brilliant idea! I love the idea of cloth, but I know my guests and mostly my hubs would never treat them with care. He would be more likely to mop up a gravy spill with them! Then they’re ruined. I love this idea! All the elegance of cloth none of the fuss! Thanks Cat! My kids would be the first to use the cloth napkins to clean up an awful mess too! LOVE this idea! I’m with you on the napkins – we have a large family and washing all of them is quite the chore. I love all of the things you could do with this idea. So fun! Wow! I never would have thought to do that! Amazing and I love it can be used over and over again! Great job!